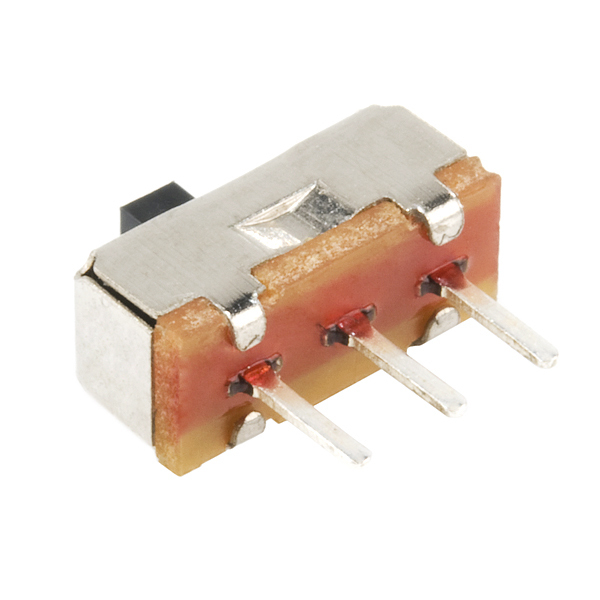 This is a simple SPDT slide switch - great for use as an ON/OFF button, or just as a general control switch. The pins are spaced by 0.1", however they are incredibly thin making breadboard use not recommended. The switch is rated for 0.3A at 50VDC. 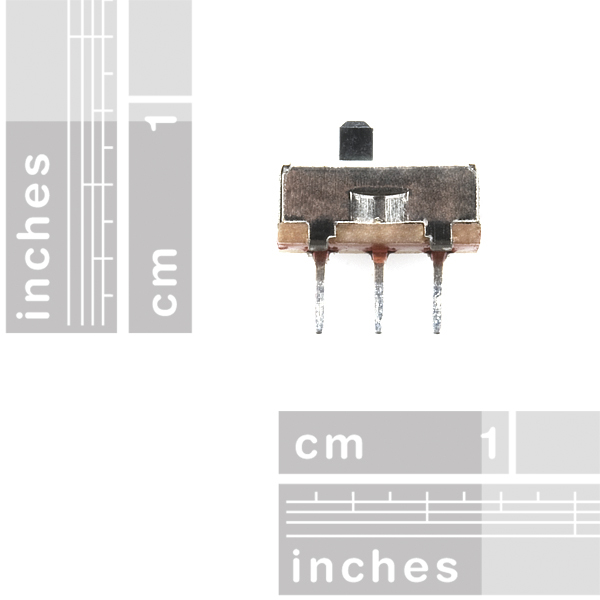 This switch is just a bit smaller than our popular SPDT Mini Power Switch, but uses the same pin spacing. Being smaller takes up less PCB space (good! ), but it does make it a bit harder to hit and flip easily. A word of warning: when soldering, use as little solder as possible. It's all too easy to form a bridge with the metal tabs on the chassis of this switch, and short the opposite throws! I definitely recommend the COM-00102 instead -- since that switch has a plastic housing this isn't a problem. Does anyone have a datasheet (manufacturer's) for this product? Utterly worthless. Intermittent contact. No resistance to any environment but the driest indoor environment. In my opinion, these are not breadboard friendly. Every time I try to switch it, it pops out of the breadboard. Having two rows of pins would make this friendlier, like the ones I got with a seeedstudio starter kit. Sadly these are not as good, and sparkfun doesn't seem to carry two-pin-row versions. 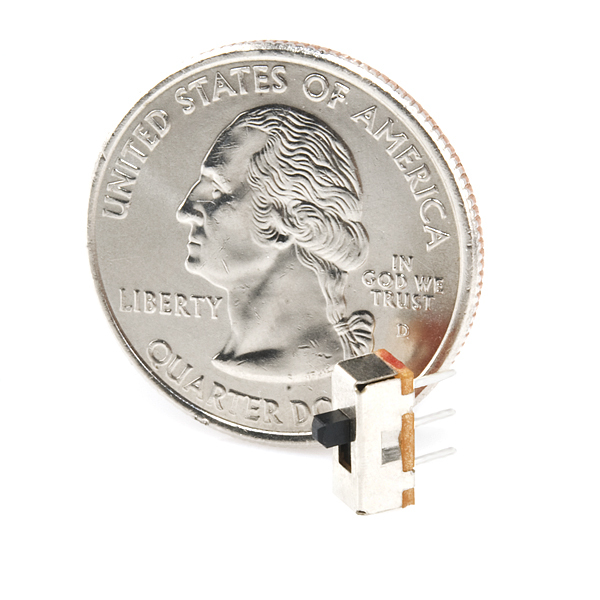 How well would this fit in a breadboard? 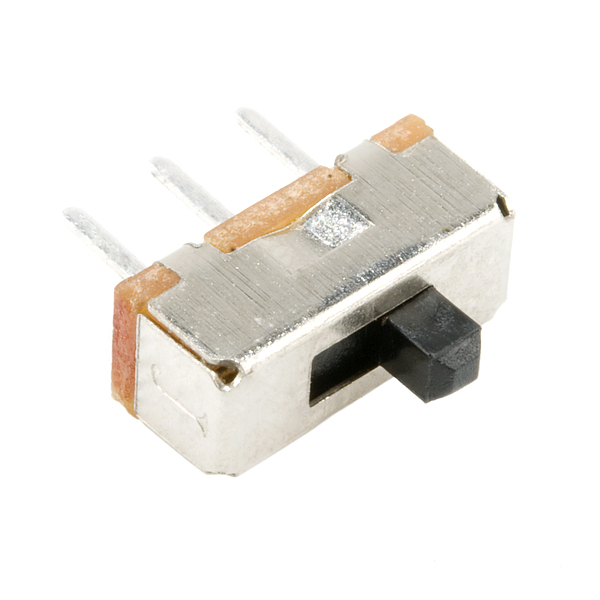 What is the digikey equivalent product? So is the rating "0.3A at 50VDC correct???????? Update: I'm getting the 4 of other one here. Or maybe this one. Thanks for the quick answer! Perhaps the terminals on the SPDT Mini Power Switch are longer, but on this one they are just barely long enough for breadboard use. The switch barely stays in the breadboard and pops out really easily. I wish the pins were longer so it stays in better. I think so too. SF please correct this.